Animas and Berg Parks are home to a network of trails along the Animas River in Farmington. These trails run along the river's edges, wind through groves of native cottonwoods, and cross the Animas River by bridge at two points. Primary access is from US Highway 64, turn north on Browning Parkway, turn west on to entrance to the City's Municipal Operations Center and take first drive to the right to Animas Park entrance. The trails in Animas and Berg Parks are nationally significant because they offer a rich variety of natural and cultural activities to the local community, the Four Corners Region, members of four neighboring Indian Tribes, as well as visitors and tourists to our region's many attractions. In addition to the network of trails that follow the river's edge and wind through groves of native cottonwoods, there are concrete paver plazas that offer periodic nodes for seating, picnicking, and organized events. The trails in Berg and Animas Parks will ultimately connect with other existing trails and facilities such as the Gateway Museum and Visitors Center, Boyd Park, and Westland Park. In addition, proposed trails along the Animas River will run throughout Farmington and head eastward to connect with the neighboring city of Aztec. Berg and Animas Parks offer health and fitness benefits through diverse recreation, such as hiking, jogging, biking, horseback riding, rafting, and nature watching. High school groups, Eagle Scouts, and the Youth Conservation Corps have been involved in maintaining and upgrading the park properties. 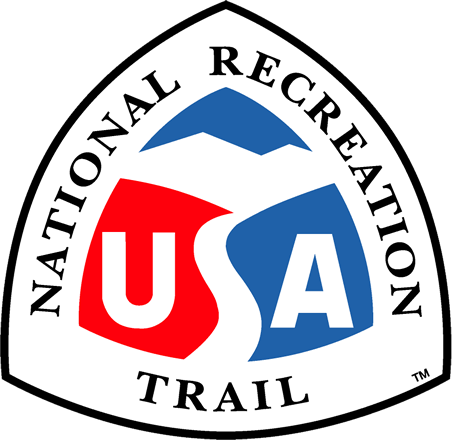 The trails service the citizens of Farmington, the neighboring cities in the Four Corners Region, and the members of four Indian Tribes by providing recreation, fitness activities, and entertainment. While some confine themselves to the land, others use the trails to put in or take out of the Animas River for the purposes of running the river by canoe, kayak, or raft. Two innovative features of the river trails are the interactive water feature in Berg Park and the constructed white water rapids in Animas Park. The riverside and woodland trails (10 to 12 feet wide) are constructed with road base and crusher fines surfacing, which provides economic and accessible paths which are easy to maintain. The nature trails (3 to 5 feet wide) are constructed of wood chips which are a byproduct of the City's tree pruning. The City has partnered with the River Reach Foundation, a nonprofit organization that promotes river improvements and activities, in acquiring river lands and funding improvements to the river corridor. The City has been the recipient of several grants and has passed two gross receipt recreation taxes for the improvements to the river corridor. The Riverine Art Project Commission has commissioned two art installations along the trails within the parks and plans to add others. The Riverside Nature Center, the Harvest Grove Barn and Orchard, and the Xeriscape Demonstration Garden provide interpretive facilities and services. The trails and park development within Berg and Animas Parks are the result of generous donations of land in the mid 1980's from several property owners and the partnership with the River Reach Foundation. Initial planning was provided in 1986 through the Farmington River Reach Regional/ Urban Design Assistance Team (R/UADT) Report. Farmington's Riverine Plan, prepared by Urban Edges in 1990, was the final document that has guided the development of the river corridor. Berg and Animas Parks are host to many community events. The most notable event is Riverfest, a music, arts, and food river celebration along the banks of the Animas River where participants may see Canadian Geese taking flight ahead of a raft full of first time river runners. Riverfest, held on Memorial Day weekend, generates tens of thousands of visitors from throughout the region. Another notable event is the Four Corners Story Telling Festival where invited storytellers from throughout the nation perform in tents along the banks of the Animas River. School children from throughout the area arrive for a day of storytelling and then the students provide their own stories from the stage. Winterglow, during the Christmas season, lights the trail with candles along the Animas River in the New Mexico tradition of farolitos. Caroling and bells can be heard as the participants and guests stroll along the river bundled against the winter chill. The trail also hosts a Renaissance Faire, numerous arts and crafts fairs, and many walkathons. The current management plan is to remove invasive nonnative species and replant with native trees and shrubs through the assistance of the Youth Conservation Corps and San Juan County grants. Plans are to acquire additional trail easements along the banks of the Animas River with the hope that the trails will extend upstream to Aztec, NM, and downstream past the confluence of the Animas and San Juan Rivers to Kirtland, NM. 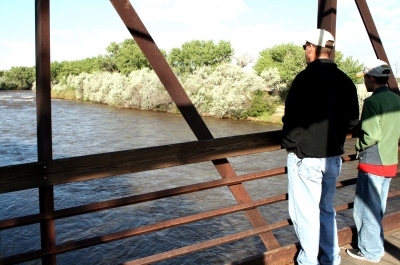 Future efforts are also planned to acquire trail easements along the San Juan River upstream to Bloomfield, NM. Bridge crossing . Photo by Jody Carman. 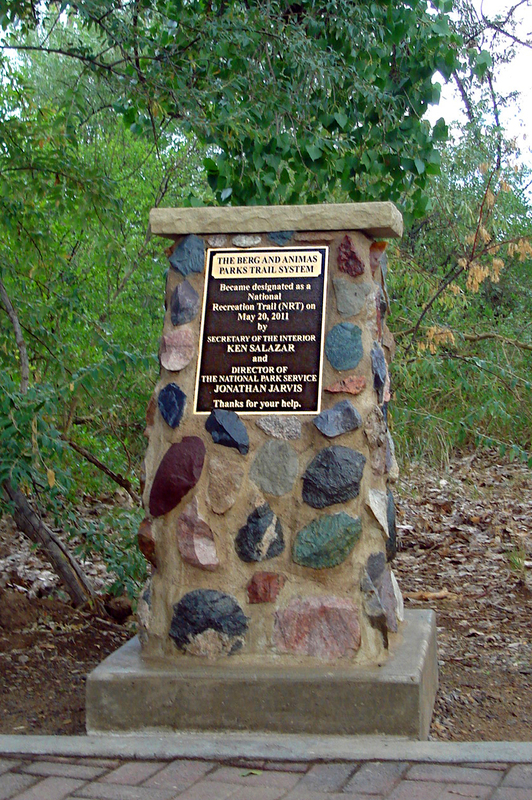 We Are So Proud: Designated National Trail plaque . Photo by Rick Willard. Who Are You: Resident wildlife . Photo by Jody Carman. Father Son Time: One of the trail bridges overlooking the Animas River. Photo by Jody Carman. Knight and Damsel: Renaissance Faire performers meandering along the trail. Photo by Jody Carman. Riverfest Run. Photo by Jody Carman. Pedestrian bridge. Photo by Jeff Bowman. River Reach Terrace. Photo by Jeff Bowman. I love this park. It's wonderful to see so many people taking advantage of our river trail! Today, I saw three momma ducks with 2, 3 and 9 babies on the river's edge by the southern walking bridge. The other day I saw a little tiny skunk digging for bugs and roots. This is one place I experience peace and harmony with the help of Mother Nature. Thanks to all who have made this such a premier spot--the Best spot in Farmington!